Will Splice become a one-stop plugin purchasing and management destination? We first encountered online collaboration platform Splice last year, when Henry Fong and J-Trick released a track through it, and now it's taken another step forward with the launch of a slick-looking plugin store. 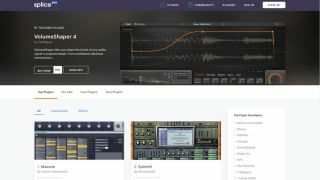 Promising 1-click purchasing/downloading of paid-for and free plugins, the store features instruments and effects from the likes of Xfer Records, Voxengo, Cableguys, Blue Cat Audio, FXpansion and Tokyo Dawn Records, with software from more companies coming soon. The idea is that, when you see that a Splice collaborator is using a plugin that you don't have, you can easily get hold of it so you don't have to worry about freezing tracks or bouncing audio stems. Splice also says that it'll manage your licenses, offering instant access to installers on your platform and updates when they're available. Take a look over on the Splice website.